The vision for Easterton Farm Park began one day in the lambing shed while bottle feeding orphan lambs. The idea grew over the next 10 years as Catriona and Kirsty’s interests expanded to calves, foals and everything imaginable in-between. Watch this space for their next wacky ideas and mad ventures. To see children and families more active and engaged in the outdoors and regenerate interest in young farming and animal husbandry. To provide a fun outdoor learning environment for children and families within touching distance of Glasgow City Centre. We create opportunities for all children and families to learn and actively participate in horse riding, farming, agriculture and animal husbandry. To spark interest and engage the next generation in horse riding, farming and agriculture. To provide a fun outdoor setting that will encourage people to become more active. To showcase top class animal husbandry practices. 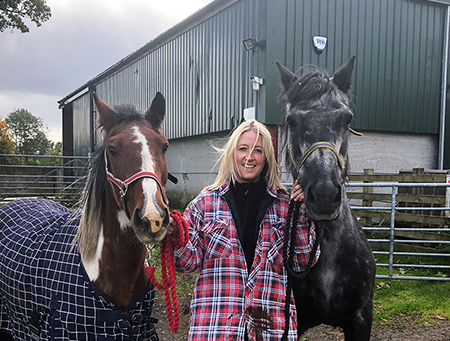 Having grown up on a working farm and subsequently taken over the management and operation, Catriona has extensive knowledge and first-hand experience of modern-day farming and agriculture. Catriona’s biggest ambition has always been to build a Farm Park that will allow children and families to explore and experience the world of farming. Having a large family unit with 7 nieces and nephews who are regularly involved in supporting the work that is at the farm and stables. The enthusiasm and life lessons which the children gain on the farm is the inspiration behind Easterton Farm Park. On leaving school, Catriona entered the world of hospitality and gained invaluable experience in customer service. Working in the 5-star hotel industry for over 24 years she learned various skills one of which was her obsession with organisation and tidiness. This can be seen around the farm and stables today. The Farm Park dream is a constant drive to push her to where we are today. Kirsty is a BHS Stage 2 and UKCC level 2 qualified coach. In 2012 she graduated at Glasgow University and achieved a first class honour’s in Veterinary Bioscience. The following year, she completed a Master’s in International Business Management at Newcastle University. Subsequently, she spent the next four years setting up and running a children’s charity. This gave her experience in a variety of life skills including working with animals, children and business development. Growing up with ‘non-horsey’ parents, her passion for horses remains a mystery to her family. None the less, from the age of seven, she was hooked and has never looked back. She spent the next 8 years falling in love with riding school ponies at Easterton. At the age of 15 she got her first horse, Nemo. They competed successfully in local district shows before progressing to British Showjumping and British Eventing. Somewhere along the way, Kirsty picked up Mary, a 14.1 TBx with more attitude than she knows what to do with. Mary has since had three beautiful foals (1 more on the way) and inspired Kirsty with a passion for breeding. 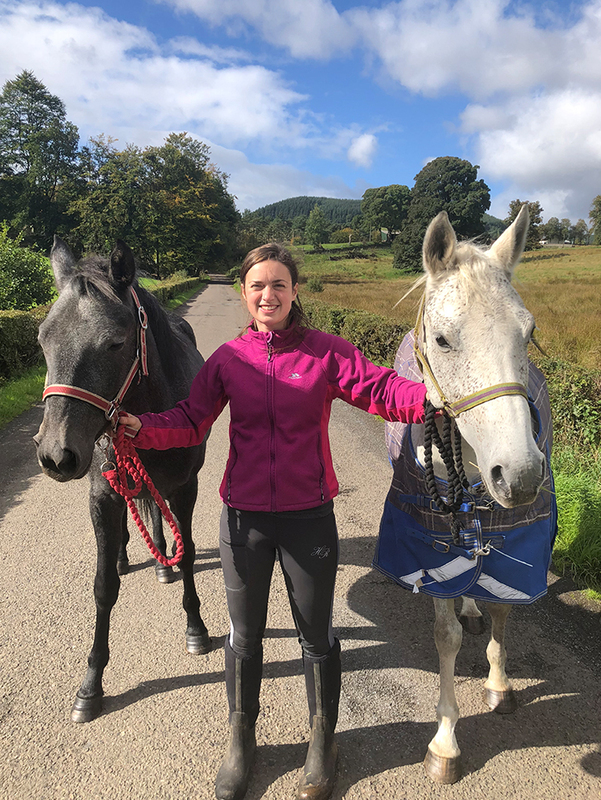 She has now backed, schooled and successfully competed her first two foals and hopes they will have a bright future in eventing. Her dream was always to combine working with animal and her passion for business leading her into this exciting new venture. Stephen has worked as yard manager at Easterton Farm Park for 3 years. He has always had a keen interest in horses from a very young age and started his career in the equestrian industry when he was 16 years old . Stephen is a qualified BHSAI and UKCC level 2 coach with over 11 years of experience teaching disabled children and adults at the RDA Group Glasgow. 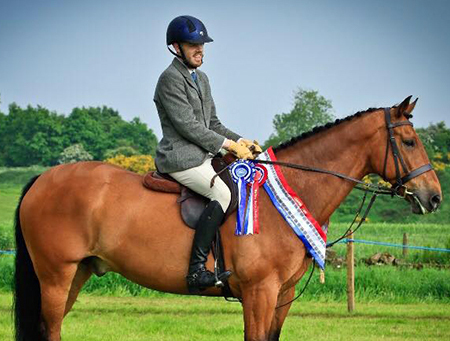 Stephen has competed in most disciplines including show jumping, cross country, dressage and showing. His real passion lies in showing and Stephen regularly competes and judges in the showing arena. He can also be seen competing up to Elementary level on his 17h horse Elton. 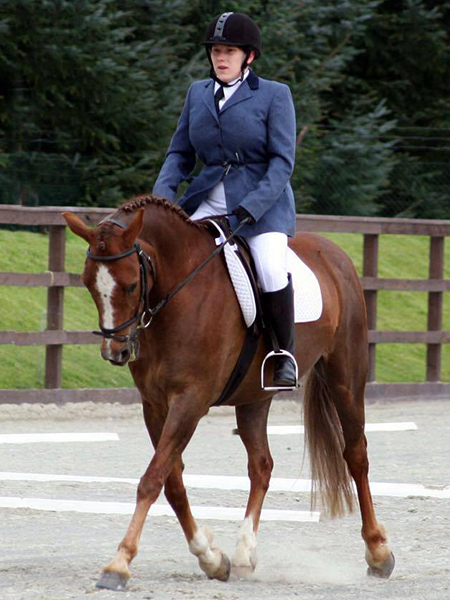 Lynne has worked professionally in the equestrian industry for over 25 years and holds BHS Stage 2, RDA, TRSS, ABRS and UKCC Level 2 Coaching qualifications. She has vast experience in Riding school, trekking and coaching all levels of riders, including those with various additional needs. Lynne has competed successfully in show jumping, dressage and showing. Lynne previously worked at Easterton for nearly 5 years a long time ago and then went on to manage at Glasgow RDA group for twelve years. In June 2018 she returned home to Easterton Farm Park where she is currently working towards her BHS stage 3. Kyle has had a great interest in horses since early childhood. On leaving school he chose to turn this loved hobby into a career and started his journey towards achieving his equestrian goals. 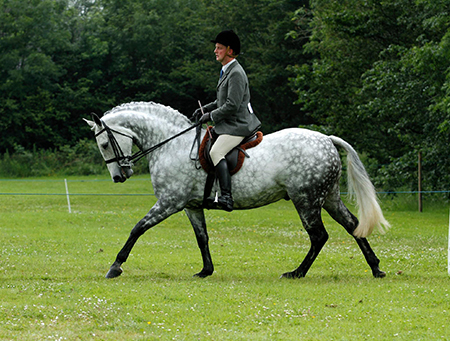 He has attained horse care and coaching qualifications and strives to achieve more. In addition to his day to day work at Easterton Farm Park, Kyle has always enjoyed working with young horses. He has trained a number over the years and now has his own horse, Kyla who he aims to compete in Eventing this year. His career also involve Showjumping and showing. In 2018 he qualifed and competes at Blair Castle International horse trials in the working hunter section.